Sea monsters have come to Reusable Art. In the late spring of 2018, this category was born. 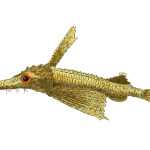 I had come across some super cool sea monster drawings and couldn’t resist sharing them with you. Many early maps included frightful sea monsters. Perhaps the authors wanted to make their exploits seem even more exciting. Or, it was perhaps an excuse for losing a ship to pirates or Mother Nature. 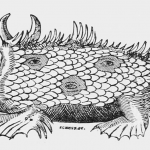 Even the well-known Mercator maps had their share of mysterious creatures that lived beneath the waves. Not sure how much use they’ll see, but, they’ll certainly add something bold and dramatic to your projects. 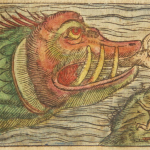 Hugely popular work during the 15th and 16th centuries, Cosmographia; contained a number of Sebastian Munster’s sea monsters; including this toothy fellow. 16th century rosmarus drawing. 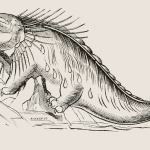 From a time when even something as peaceful as a walrus was often turned into a dreadful sea monster. Vacca Marina drawing, one of several from the 16th century artist and historian Olaus Magnus. Fierce, yet, friendly-looking walrus-inspired sea monster. 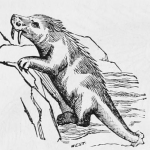 Fantastical depiction of Norwegian Walrus from Scandinavian mythology. 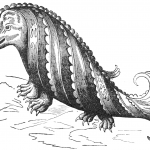 One of 6 versions of walrus-like creatures created by Olaus Magnus in 1555. What do you get when you cross a pig, a fish and a walrus? A porcus monstrosus of course. Fun sea creature drawing from the Swedish historian Olaus Magnus.